NorthSky’s Residence Four home was named Home of The Year by the Denver Homebuilders Association, winning the MAME Award in it’s category. It was featured in a recent press release which you can read below. We are honored that the combination of Warm, Modern, Architecture and the dedication of our team at Berkeley Homes and Harvard Communities has made NorthSky a great success! 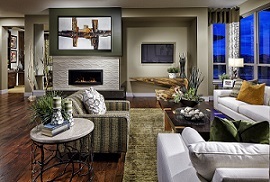 Denver, Colorado, October 29, 2014 — Colorado homebuilder Berkeley Homes, in partnership with Harvard Communities, was recently awarded this year’s prestigious MAME Award for Home of the Year. MAME stands for Marketing and Merchandising Excellence and serves as the Denver area home building industry’s annual award ceremony to honor top marketing and architectural achievements in the new home industry. The event was held in early October at the Denver Center for the Performing Arts’ Sewell Grand Ballroom. As one might expect, the award-winning model is also a SkyRidge top seller. “The 3,883 square foot Residence 4 plan is a stunning two-story plan featuring warm, modern design and detailing,” says John Keith, owner and president of Harvard Communities and NorthSky project partner. “The open floor plan also features a dramatic entry, formal dining room, split 3-car garage, beautiful and functional kitchen—with a unique oversized island and walk-in pantry—and oversized family study with space for the whole family to work, relax or play together.” If that weren’t enough, all Residence 4 plans are built on walk-out lots with large covered main floor decks and all feature master bedrooms with spa-like master baths and private decks with gorgeous views. Berkeley Homes in NorthSky come with easy access to miles of walking trails, parks and open space, the Lone Tree Rec Center, the Lone Tree Performing Arts Center as well as plentiful shopping and nightlife attractions in both RidgeGate and the nearby Park Meadows area. The community is also well located near the SkyRidge Hospital, Cabela’s and the new Charles Schwab office campus, with easy access to Interstates 25, Colorado 470 and south metro light rail stops.